Here lies the end of my journey in The Realm of the Elderlings. Robin Hobb, if you’re reading this, thank you for saving your best work for the last installment. Assassin’s Fate marks the conclusion of The Fitz and The Fool trilogy and at the same time, it’s also the final installment within Robin Hobb’s overarching The Realm of the Elderlings series that’s comprised of sixteen books in total. I started my journey into this series on January 15th and somehow, coincidentally it all ends on April 15th; it took me exactly three months to read all sixteen full-length novels + one novella + one anthology (4.1 million words within 11473 pages of the UK paperback edition) and what a journey this has been. It gladdens me to say that Assassin’s Fate ended up becoming my favorite installment out of all Robin Hobb’s works, by far; it was a heartfelt, bittersweet, and a satisfying conclusion for the series that completely left me in awe of Hobb’s capability as a writer. Having finished this book, I can finally understand why people kept on raving about Robin Hobb being the current reigning queen of high fantasy; as it turns out, she also has become the first female author to be included my favorite authors of all-time list. Like all Hobb’s books, this one started off slowly for the first half despite continuing immediately after the cliffhanger in Fool’s Quest. That said, don’t let this let you into thinking that this book will be similar to Hobb’s previous books. There are so many things that happened here and you can only fully appreciate everything if you actually read all Hobb’s books, not only the one that features Fitz. Assassin’s Fate is amazing because Hobb converged all the previous plotlines and the key characters from all her series into this one, this is especially true for The Liveship Traders. This book is a culmination of twenty two years of Hobb’s works and it blew all my expectation out of the water. “To Fitz and the Fool. I can’t emphasize how incredible this last installment is. I won’t lie that it hasn’t been a smooth sailing going through this series but the most important thing is that it was worth the struggle. What makes Hobb’s books amazing? Well… There are plenty of reason and I talked about them like a broken record already but let me repeat the most important thing one last time (insert Fast and Furious meme here). The excellent characterizations. Hobb’s characters—excluding Rainwild Chronicles—are extremely well-written and believe me, the characters will become real in your head and heart. My favorite parts of this series lies definitely in this aspect: the relationships formed between the characters and how the passage of time affect us as a person. Fitz may not be a favorite of mine but his narration about coming of age, friendships and family is just so incredibly compelling and evocative because of Hobb’s prose. Fitz’s relationships with Nighteyes, The Fool, and Bee in particular are definitely one of the best experience I’ve ever had in reading. The first 50% was dominated by Fitz’s travelling to Clerres, this is in a way almost similar to the dreadful Assassin’s Quest travel sections but one simple thing separate this one from that: The Liveship Traders characters. As I said before, everything converged here and because of that, even seeing the characters just talking and interacting with each other brought a joy that only readers can understand. Finally seeing Fitz interact with the Liveship Traders’s characters which I loved made the slow part of the book immensely enjoyable to read. Contrary to my belief that Hobb can’t write a great action scenes, she clearly proved me wrong here. The last half of this book was an emotional rollercoaster and tension packed. It was intense, full of twists and turn, and at times heartwarming and beautiful. I truly didn’t expect this capability from Hobb, the final action sequences in this book almost look like something that Sanderson wrote. Hobb properly build every single thing in Fool’s Assassin towards this final battle, with chapters ending in cliffhangers all the time, the last half was an unstoppable page turner that will relentlessly tug on your emotion. There aren’t anything left I can talk about without spoiling or giving hints about this book. I pondered about it for a day on how to approach writing this review and this is pretty much all I can say about the book itself. As for the series itself, let me first say that Robin Hobb is clearly a fantastic author. However, most of her books in my opinion do have pacing problems and being repetitive, this is especially true in Assassin’s Quest. Not only that, I also think that The Rainwild Chronicles are still unnecessary to read. Sure, you’ll miss some nuance about Silvers, Dragon Blood, and Kelsingra but for me, it wasn’t worth going through the pain and frustration I had reading Rainwild Chronicles only to get to this book. With the exception of Assassin’s Quest and Rainwild Chronicles, Hobb never fails to constantly deliver a great book. It’s really weird that Hobb gave me one of the worst series I’ve ever read (again, The Rainwild Chronicles) and also one of the best series I’ve ever read (this trilogy, The Fitz and the Fool trilogy), Other than the one I mentioned, all her books received 4-5 stars rating from me, heck this book actually deserve a 6/5 stars. I know a lot of people want Hobb to write more books in this world, I personally don’t. Let’s be real here, this series is massive already and there are a lot of moments where the story dragged longer than it should; most of all though, it’s because I doubt Hobb can write a better ending for this series than this. This book is a culmination of all Hobb’s work, she has poured every groundwork from her careers into this book, furthering the series beyond this would just be forcing it. Anger, laughter, sadness, heartwarming, these emotional impact I got from this series are something I’ll remember. Robin Hobb’s achievement on completing The Realm of the Elderlings is stupendous and something that readers in the future will always remember. I have lived my life with these characters beside me for a full scope of three months, these characters have become ‘real’ in my head but it’s over now. It’s time for me to let go and move on to other worlds. That said, this is not final goodbye. 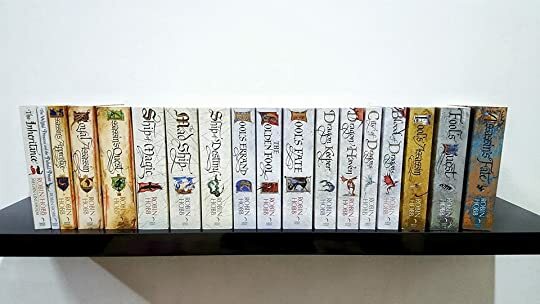 One day when I miss the characters dearly, I know I’ll visit the words on these books again because there’s only two words left to describe my feeling of completing this massive series: I’m content.